Enter 1 - 4 passengers per booking page. Introducing the new Bimini Fast Ferry with service from Miami, Florida to Bimini, Bahamas. The Bimini Fast Ferry has a capacity of 427 passengers and features both economy and business premium seating. 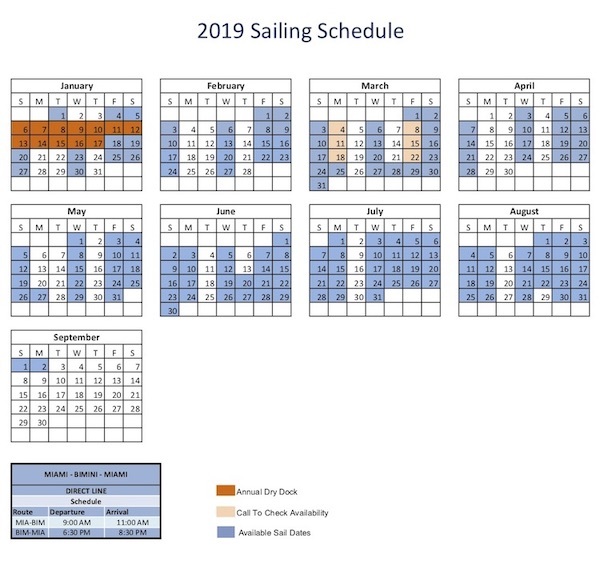 The Bimini Ferry sails from the Port of Miami on Friday, Saturday, Sunday & Wednesdays most months and more frequently during July and August. The Bimini Fast Ferry offers one-way service, day trips (over and back same day) or split dates (depart one day and return another). Add accommodations at the Hilton at Resorts World Bimini and receive a discounted rate for booking both together. Book online now or call (800) 991-0623 and speak with a travel specialist. All passengers traveling to Bimini by fast ferry service are required to present a valid passport or a U.S. passport card. If you're booking a day trip to Bimini you now have the option of adding a day pass at the beautiful Hilton at Resorts World Bimini. Sunbathe with turquoise waters and white sand beaches. Your day pass will give you access to their Sabor Pool, Beach club, Towels, Wi-Fi and transportation to move around within the resort. Traveling by ferry service requires that U.S. Citizens present a valid passport or passport card for travel. Birth certificates for U.S. citizens are no longer accepted, as of December 24, 2018. Amazing Trip - LOVE Bimini! We left on Dec 24th - and this is the only way to go! From check in at the Port of Miami - which was quick & easy - to hopping on the ferry and the great crew that took care of us - to the arrival in Bimini (we highly recommend arranging for a golf cart while on the ferry over) - to the incredible week visit we had & our return home - it couldn't have been better! We were there over the Christmas holiday. We both were concerned about getting sea sick so we planned ahead and started with our Dramamine the day prior. We heard that folks were ill because the water was rough due to the weather & wind - but we didn't have any issue. We did the same on the way back. Better to be prepared than not! And certainly the crew can't help the weather! So prepare yourself! The ferry ride there & back was really great. The return one being so dark out- wasn't much to see - but everything was seamless. We will never fly again when we can go this route. It was less stressful - more fun and we thoroughly enjoyed it! Beautiful island, bad boat service. Getting on the boat was easy. I repaid an extra 80 for my friend & I for “priority” DO NOT WASTE YOUR TIME. The priority said we would have priority boarding, not true. We were told a light breakfast and snack was included. Not true. We were told we had access to the “sundeck”. The sundeck was a measly 15 foot back of the boat where everyone was going back and forth. Ridiculous. The food was HORRIBLE. Don’t waste your money. 9$ for a 3inch burrito. Tasted undercooked And gross. The employees were rude!!! People just asking questions and they are so mean with their answers. Took about half hour to leave after departure time. Once we got there the island was beautiful and the staff there were SO friendly. We had a great time. Would go back again but don’t waste time on paying anything extra or buying any food or drinks. Not worth it. But island is worth it!!! Click the button below to add the Bimini Fast Ferry | Service From Miami To Bimini, Bahamas to your list and contact a travel agent.